New without tags wedding dress size 10-12. Dispatched with Royal Mail 1st Class. 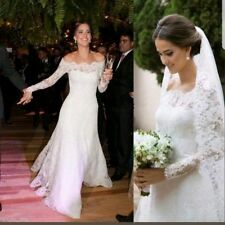 Beautiful lace wedding dress never been worn only because it's too small.i thought u could lose weight to fit into it but left it too late. Colour __Ivory. Note: the lace displayed on the picture might be slightly different from the lace used in the dress. This due to availability, but it will be of very good quality. Fabric _ lace. one Hand made wedding dress. You can be rest assured that your gown will be beautifully finished. Fabric - lace, tulle. Colour - White. This beautiful wedding dress will be Fabulously made with exquisite detailing. one custom made wedding dress. Note: the lace displayed on the picture might be slightly different from the lace used in the dress. This due to availability, but it will be of very good quality. Fabric _ lace. Colour - white. one Hand made wedding dress. You can be rest assured that your gown will be beautifully finished. Colour - Ivory. Fabric - Tulle, lace appliqués. This beautiful wedding dress will be Fabulously made with exquisite detailing. UK Size Chat. Lovely 1960s wedding dress worn once. Size 10. Lovely 1960s wedding dress worn once. Size 10. Bought new from wedding boutique in London. Exact year of purchase 1965. In great condition. Complete with original box if required. It's standard 12 UK size. In a beautiful long sleeve bardot style and all over lace and sequin bodice flowing into a fishtail gown, wear with silver heels and accessories for a glam look. Bardot style. Lace and sequin fabric bodice. Colour - White or Ivory. Fabric - lace, tulle. This beautiful wedding dress will be. UK Size Chat. • Dress colour. If you are unsure of the style of dress that will suit you - This is the one. This dress is exactly as the photo (real image). Brand new, Never Worn Lace Wedding Dress . Condition is New with tags. Dispatched with Royal Mail 1st Class. This wedding dress was made to measure - to fit UK size 12/14. I never wore the dress on the day, so it is brand new and unworn. I originally paid £370. Fully lined so able to wear a bra, made of ivory antique lace, with light sequin shimmer. There are two splits up the front of the dress, to just above the knee (these can be tailored to not be there). The bottom of the dress and sleeves are scalloped with lace, and there is a small train at the back. The dress has a great weight to it, and is beautiful. Any other info or images - please just ask. Fabric - lace, tulle. Colour - White. This beautiful wedding dress will be. UK Size Chat. SIZE AVAILABLE- size 12. one handmade wedding dress. If you are unsure of the style of dress that will suit you - This is the one. 1: If you want the dress, it will be not include any accessories such as gloves, wedding veil and the crinoline petticoat ( show on the pictures). Our products include Wedding dresses and special occasion dress,wedding party dresses. Portrait style neckline with ruffled lace collar & long sheer lace sleeves. Polka dot spotted lace to the bodice with a satin 'belt' to the waist that has long ribbon ties to the back. Nipped in waist falling into a wonderfully full, tiered skirt Fully lined with a netted petticoat allowing the dress to stand proud. Lovely ivory wedding dress with lace pattern detail and long sleeves. Stunning train and button back detail. Zip button back. asian bridal dress. Size 40 brand new never been worn. You can be rest assured that your gown will be beautifully finished. Colour - White or Ivory. Back closure - lace up. Fabric - lace, tulle. This beautiful wedding dress will be. This dress is exactly like the picture. All dresses are made by our own professional factory. Quality product from start to finish, from material to construction. All at affordable prices ! Our goal is to continue to earn our reputation. (The wedding dresses does not include any accessories such as :gloves, wedding veil and the crinoline petticoat ( if these accessories show on the pictures ). Petticoat Item number is: ). Fabrics we used include satin, tulle. You can be rest assured that your gown will be beautifully finished. Colour - White or Ivory. In built bra- yes. Fabric - lace. If you are unsure of the style of dress that will suit you - This is the one. Colour - White or Ivory or champagne. Fabric - lace. This beautiful wedding dress will be. • Dress colour. UK Size Chat. If you are unsure of the style of dress that will suit you - This is the one. one handmade wedding dress. 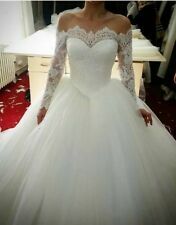 Elegant hand made lace wedding dress, used once for 3 hours, washed and in good condition.Size between 10/12. Very nice, in very good condition wedding dress with marabou feathers. Colour - White or Ivory. Fabric - lace, tulle. This beautiful wedding dress will be. UK Size Chat. • Dress colour. If you are unsure of the style of dress that will suit you - This is the one. Real image. You can be rest assured that your gown will be beautifully finished. Colour - White or Ivory. Fabric - lace, satin. This beautiful wedding dress will be. • Dress colour. one handmade wedding dress. UK Size Chat. You can be rest assured that your gown will be beautifully finished to the highest standards with exquisite detailing and is fully lined. Colour - White or Ivory. Fabric - lace, tulle. • Dress colour. You can be rest assured that your gown will be beautifully finished. Colour - White or Ivory. Back closure - lace up Back. Fabric - lace. If you are unsure of the style of dress that will suit you - This is the one. There are two stains on the dress but both are not visible to others whilst wearing the dress. One stain is under the hem of the dress and the second stain is on the underneath side of the dresses fabric. Colour - White or Ivory. Fabric - lace. This beautiful wedding dress will be. UK Size Chat. • Dress colour. If you are unsure of the style of dress that will suit you - This is the one. one handmade wedding dress. Long sheer lace sleeves & a sheer lace panel to the chest, finished with a ruffled 'shawl'. Stunning Ankle Length Wedding dress circa mid 1970s. Wedding Dress in Ivory. High neckline with a lace collar. Used wedding dress size 10-12. Condition is Used. Dispatched with Royal Mail 2nd Class. Embroidered lace detail, deep V shape back, fishtail shape, long train. Comes with detachable sleeves, in mint condition, it has been stored since Nov 2018. Absolutely gorgeous size 10 white wedding dress, with long sleeves and a choker style neck line. Modest and elegant. Reluctantly selling because it doesn't suit my body shape. This dress is brand new and only tried on once. It is UK size 10 but may require some alterations with the sleeves and general sizing (it was a little too big on me but I'm a small 10). Please feel free to contact me with any questions.